The Nvidia GTX 1050 is a mainstream GPU based on the Pascal architecture and was announced in January 2017. Contrary to the faster models, the GTX 1050 uses the GP107 chip, which is manufactured in a 14 nm process at Samsung. The notebook version differs a bit in terms of clocks, but is equipped with 640 shader units, just like the desktop model. It is shipped with up to 4 GB GDDR5-VRAM attached via 128-bit interface and a 7 Gbps memory data rate (112 GB/s). The GP107 chip is manufactured in a 14 nm FinFET process at Samsung and offers a number of new features, including support for DisplayPort 1.4 (ready), HDMI 2.0b, HDR, Simultaneous Multi-Projection (SMP) as well as improved H.265 video de- and encoding (PlayReady 3.0). 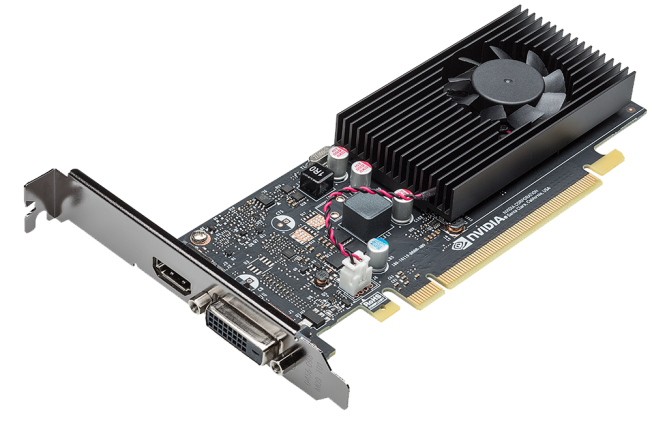 A full list of improvements and the new Pascal desktop GPUs is available in our dedicated Pascal architecture article. The performance of the GeForce GTX 1050 can vary quite a lot depending on the cooling performance of the laptop. It can be just as fast as the desktop model under ideal conditions, but the notebook model is usually a bit slower. The GeForce GTX 960M is beaten by around 30%, so the GTX 1050 is comparable to a GTX 965M in general. It is therefore an upper mainstream GPU. Games from 2016 can be played in high settings an the Full HD resolution. The power consumption of the GeForce GTX 1050 is roughly on par with the old GTX 960M, which would mean around 40-50 Watts and (probably due to better selection and optimized parts) therefore much lower compared to the desktop counterpart. This means the graphics card will usually be used for powerful multimedia notebooks and entry-level gaming systems with at least 15.4 inches. The Nvidia GeForce GTX 1080 SLI for laptops is a combination of two GTX 1080 graphics cards in SLI mode. Each card renders one frame at a time (AFR mode) but depends for most games on a good profile in the driver. Therefore, the performance can range from no gains over a single GTX 1080 to up to 90% faster performance. Sometimes, the combination may also suffer from micro-stuttering. The technical details of the card are identical to a single GTX 1080 (see for more information) and the power consumption is doubled. Therefore, the 1080 SLI combination is only found in huge clunky laptops.